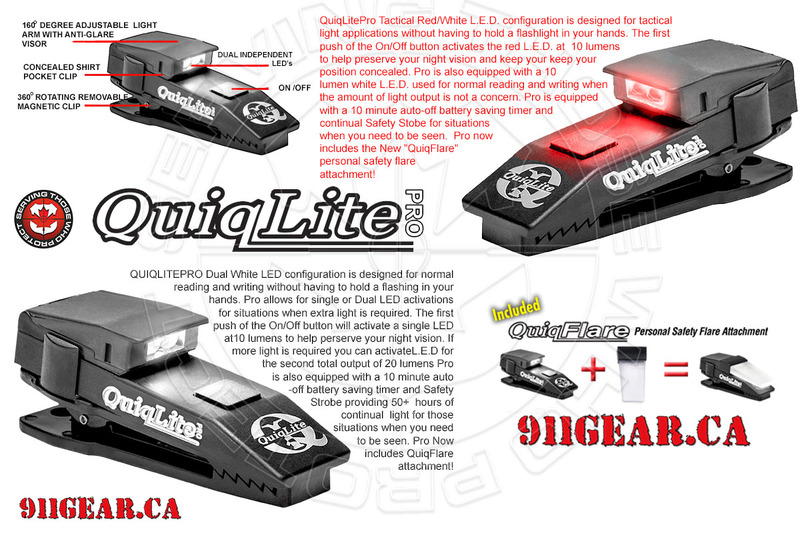 QuiqLitePro Tactical Red/White is now available at 911gear.ca. This L.E.D. configuration is designed for tactical light applications without having to hold a flashlight in your hands.The first push of the On/Off button activates the red L.E.D. at 10 lumens to help preserve your night vision and keep your position concealed. Pro is also equipped with a 10-lumen white L.E.D. used for normal reading and writing when the amount of light output is not a concern. Pro is equipped with a 10-minute auto-off battery saving timer and continual Safety Strobe for situations when you need to be seen.